Anyhow, now that we’ve defined the proton, neutron, and especially the electron, it’s time to figure out what to do with them. As always, if you see a little superscript, look for an accompanying footnote at the bottom of the page. The “X” is the atomic symbol. This tells us the symbol of the element that’s represented. Though we don’t really need this symbol if we have the atomic number (helium will always have an atomic number of 2, for example), it makes our lives easier to just write it anyway. The “A” is the average atomic mass of the element.² If you were to pick a bunch of atoms of this element out of a bag, the average of the masses of each particle will be this number.³ In Figure 1, we see that A is equal to 4.00, which means that helium has an average atomic mass of 4.00 amu/atom or 4.00 g/mol. Let’s say that you’ve got an atom of helium in your pocket (for some reason). 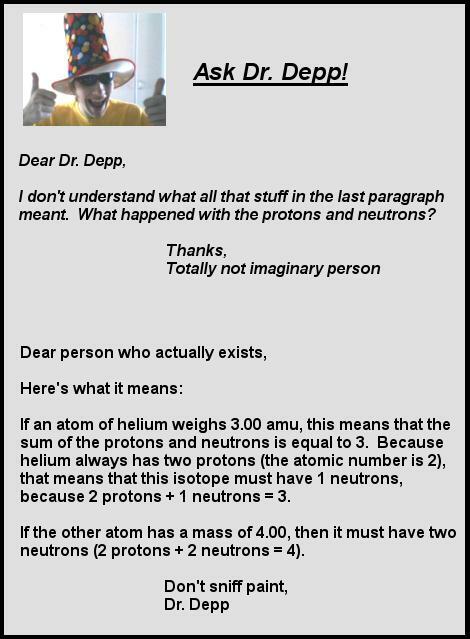 When you put it on a very tiny scale, you find that the mass of the atom is 3.00 amu.⁴ Awesome. Let’s say that a friend of yours gives you another atom of helium. When you put that on your tiny scale, you find that it weighs 4.00 amu? What’s going on? You’ve just learned about isotopes. As you know, neutrons are present in an atomic nucleus to keep the protons from repelling too much. Because there may be more than one possible number of neutrons that will do this, there will be more than one possible form of that element. These different forms are the isotopes. The isotopes of an element have different masses because the mass of an atom is equal to the number of protons + the number of neutrons. All atoms of an element have the same number of protons, but if there are different numbers of neutrons, the mass of each form (i.e. isotope) will be different. In our example above, the helium atom with a mass of 3.00 amu had two protons and one neutron, while the atom with a mass of 4.00 has two protons and two neutrons. And what about electrons? Neutral atoms have equal numbers of protons and electrons to keep the charges neutralized. However, ions are an entirely different story, and will be something to read about later! No matter what you use, remember that the term “isotope” doesn’t mean that something is radioactive, poisonous, or ready to explode. Every atom in the universe is an isotope of some element. As mentioned before, the term “isotope” just signifies what flavor of the element we have, not what properties that flavor have. What’s the deal with elements that have atomic masses that aren’t whole numbers on the periodic table? If you refer earlier on this page, you’ll see that this number refers to the “average atomic mass”, which I said would be the average mass of the atoms that you’d find it you pulled a bunch out of the bag at random. For example, if you had an element for which 50% of the atoms weighed 12 amu and 50% weighed 14 amu, you’d correctly assume that the average atomic mass would be 13 amu. The isotopic masses aren’t whole numbers. We’d like to pretend that an atom of copper-63 weighs 63 amu, but the actual number (for reasons we’re not going to discuss) is actually 62.930 amu. Demons. Though I haven’t found it to be successful in either my personal or professional life, I maintain that many of my screw-ups are due to demons. Fortunately, we can find average atomic masses with no problem at all. All we have to do is take a weighted average of the masses of each isotope. Which is a fancy way of saying that we’re going to account for the fact that there are uneven abundances of each isotope. A sample problem: Copper has two stable isotopes: copper-63 has a mass of 62.930 amu and copper-65 has a mass of 64.928 amu. If a sample of copper contains 69.17% copper-63 and 30.83% copper-65, what is the average atomic mass of copper? average atomic mass is what we’re trying to solve for. Let’s call it x.
mass of isotope 1 (copper-63) is 62.930 amu. abundance of isotope 1 (copper-63) is 0.6917 (remember, we have to convert percent into decimal form by dividing by 100.
mass of isotope 2 (copper-65) is 64.928 amu. abundance of isotope 2 (copper-65) is 0.3083. [and so forth] doesn’t exist because there are only two isotopes. If there were more, than you’d have to keep doing the same thing for isotope 3, 4, and so on. Which is pretty much what you find on the periodic table. (Rounding differences account for the 0.01 amu difference). How do they figure out isotopic masses and abundances? They do this using mass spectrometers, which are interesting little machines that you can read about on this page. Actually, they’re not that little. But they are interesting. And very, very expensive. Subatomic Particles Practice Sheet: Test your skills with proton, neutron, and atomic mass fun! 1. The atomic number / number of protons is the same for all atoms of an element. The mass, however, may be different in different atoms, which leads to the idea of isotopes. Don’t worry… we’ll get to it. 2. The average atomic mass of an element is usually just referred to as its atomic mass. Which isn’t technically true for reasons we don’t really care about, but is always done anyway. It’s also not wrong to call the average atomic mass the “molar mass”, because one mole of the element will weigh that many grams. More about moles later. 3. Or not. There’s actually a lot of controversy about this number because, depending on where the sample of interest came from, the average mass of the particles in the sample may be different. For example, differences in the isotopic makeup in a sample are common in geochemistry and can also be used in carbon dating and in identifying nuclear material. For a table illustrating this point, check this out. 4. For you purists out there, I’m well aware that the mass of a helium-3 atom will actually be 3.02 amu. I’m making a point, so just go with it. 5. Same as #3 – I just wanted to remind you. 6. It’s hard to say how much a mouse lemur costs because they are so endangered that they aren’t openly sold. However, the much more common ring-tailed lemur is sold as a pet in the United States at prices between $1,000-$4,000. I’m not going to include a link, though, because you probably shouldn’t buy one. 7. 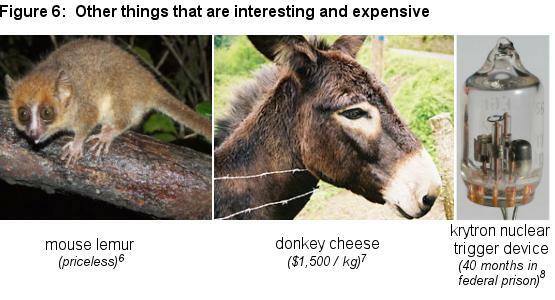 Only 100 donkeys in the world produce the milk needed for this cheese, and only in May and June. Since it takes 25 liters of this milk to make 1 kilogram of cheese, it’s practically a bargain! 8. Because krytrons can be used to trigger nuclear detonations, the United States government is pretty serious about keeping them from being exported. The “40 month” number comes from a case in which 300 were sold to Israel in the early 1980’s, resulting in a guilty plea and subsequent prison sentence for violating the US Arms Export Control Act. Link. Dr. Depp image: By BananWiki at sv.wikipedia [Attribution], from Wikimedia Commons. Why this person put it up as a file with unrestricted use, I have no idea. Ice cream: By Kaawassey (Own work) [CC-BY-SA-3.0 (http://creativecommons.org/licenses/by-sa/3.0)%5D, via Wikimedia Commons. Mouse lemur: By Bikeadventure at German Wikipedia (Own work) [Public domain], via Wikimedia Commons. Donkey: By Greudin (Own work) [Public domain], via Wikimedia Commons. Krytron: By John Rehwinkel (Image by John Rehwinkel.) [Public domain], via Wikimedia Commons. This webpage and the related worksheets are licensed under the Creative Commons Attribution-NonCommerical-ShareAlike 4.0 International license (CC BY-NC 4.0). For more information about this license and how it affects how you can use the contents of this site, click here. For those of you who need to cite this using incorrect methods such as MLA, APA, and Turabian, it was written by Ian Guch on November 7, 2014. If you’d like to cite this page correctly using ACS style, click here.